Over the years, we have released quite a few memorable products. Our influences range from popular culture, sports, history and of course, Japanese mythology. RMC Jeans is the brainchild of Martin Ksohoh, and the products of this brand are fuelled by his eccentric and bold designs. With a penchant for art from a very young age and a deep sense of respect for Oriental culture, Martin has created some splendid designs over the years. These designs have quickly helped propel RMC Jeans to Fame. It has also helped us earn a cult status among denim enthusiasts all over the world. One such brilliant collection of apparels that we currently have in stock is the Kamon collection. 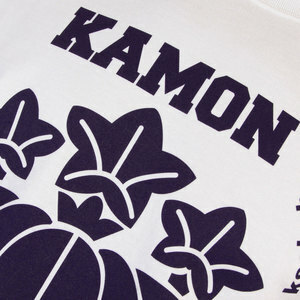 It is a homage to the concept of ‘Kamons’ or the family crests of Japan. These designs are literally inspired by a tradition that was prevalent in medieval era Japan, the tradition of family crests. Unlike in the west, the concept of the family crest was not exclusive for use only by the nobility and royalty only in Japan. I was an integral part of even middle-class families. It started off as a novel way of recognizing the identity of a family. It came in handy with things like identifying to which family a set of goods, a business or a home belonged to. During the ‘Edo era,’ this concept reached such great heights that Japanese families were required to have a family crest over a surname. This led to the birth of numerous family crest symbols. More than a staggering 5000 + Kamons are recognised and archived in Japan today. It wasn't until the dawn of the 20th century and well after the end of the first world war that the administration in charge at that time made surnames mandatory over family crests again, thus officially marking the end of the use of family crests in Japan. Despite the fact that they are not officially in use anymore, Kamons are still an integral part of Japanese culture to this very day. They make appearances in important social events like marriage for example. At RMC jeans, what we personally like about Japanese Kamons are their magnificent mix of simplicity and intricate details at the same time. What we mean by this is, at the first look, a Kamon looks like nothing more than a seal stamp. But it is just not quite as simple as one. It has far too many details tactfully accommodated into a small space. Its silhouette shadow appearance magnifies its enigma. The RMC jeans Kamon collection is a celebration of these iconic family symbols. We have taken some famous Kamons, especially those that represented well known Samurai families and have incorporated them in our own signature style on to our apparels. The Kamon collection of RMC clothing consists of Kamon embroidered denim jeans and Kamon printed T-shirts with rich artwork. The RMC jeans Kamon collection manages to encapsulate the charm and the majesty of these legendary symbols of Japanese heritage. It also makes for a fantastic collection of men's clothes that are rich in artwork. We continue to enrich our product line with some inspired designs and the Kamon collection ranks very high on our list of products that can help you make a stunning style statement with your casual fashion.